These dried flowers are well known for their relaxing and sleep inducing aromatherapy properties. It’s as simple as putting some of each in a bag and reaping the benefits. Dried hops were extensively grown in the UK, particularly in Kent for many years as a part of the brewing industry, and can often be found growing in hedgerows. So if you don’t want to spend any money, try going for a country walk in September and see if you can spot any! Dry thoroughly before use. Lavender is easy to come by as many gardens have a bush. Check out these articles about which lavenders to choose for drying and how to dry lavender. In my opinion, varieties of Lavandula Angustifolia have the most soothing aromatherapy properties. 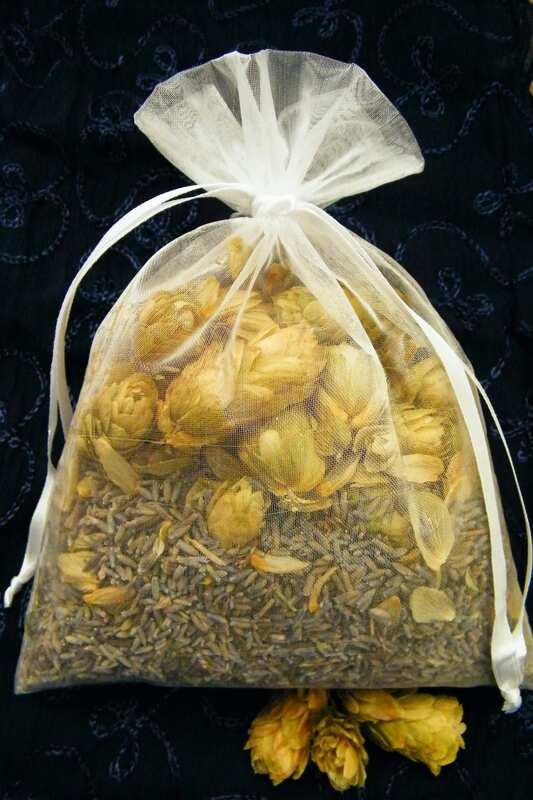 Just take a largish bag – the one in the image is about 15x20cm and holds two handfuls each of dried lavender and dried hops. It is good for two reasons – the drawstring closure allows the mixture to be topped up or replaced as needed; and the open nature of the organza allows air to circulate freely, carrying the relaxing fragrance with it. But of course, the bigger the bag, the bigger the effect. So other options for people like me (who are strangers to a sewing machine) would be to fill a small pillowcase and tie the end with ribbon, or use a zip-up cushion cover. Sleep with the bag under your pillow or as near your bed as you can get it – hanging on a bedpost perhaps. 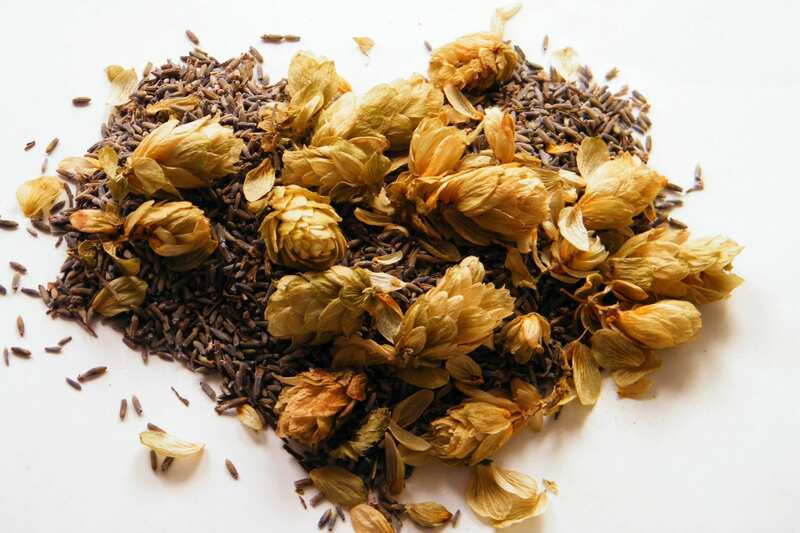 Dried hops are known for the bitter flavour they add to beer when used as a preservative. So if you haven’t experienced the fragrance of hops before, don’t expect them to be entirely pleasant. Luckily the fragrance of the dried lavender adds a great deal to the mix, and in my view the benefits outweigh the disadvantages. But alternative sleep pillows could be made by either a) using dried lavender alone, or b) substituting the hops for chamomile. Chamomile is known for its soothing aromatherapy properties and has an apple-like fragrance. 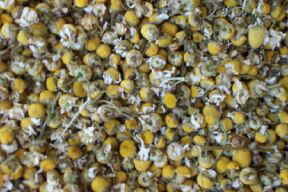 Dried flowers of chamomile look like small yellow balls.